My sweet co-worker from Ann Arbor (Olivia) gave me this wonderful recipe almost a year ago... and I have made it about every week since. ;) It is super easy and tastes even better heated up the next day - the perfect meal for my husband. No need to be exact... According to Olivia, "just add a little of this, and a few shakes of that." As a novice in the kitchen, this makes me very uneasy. I like instructions and order - I don't want to guess the recipe! Well folks, go forth uneasily, because Ms. Olivia has not bestowed upon me the exact measurements(but it tastes great anyway!). Thanks for pushing me out of my comfort zone, Olivia! 1. Cook your chicken in the crock pot on high for 4 hours. 2. Shred the chicken and add your beans (water from the can included), salsa, cubed cheese, and cumin. 3. Cook in your crock pot until all of the cheese is melted. 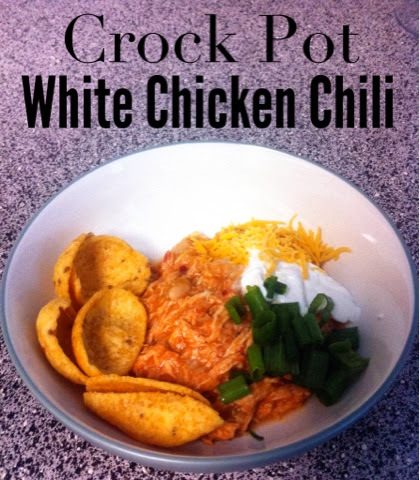 I served the chili with sour cream, green onions, shredded cheese, and Fritos, but serve it with whatever fancies you!